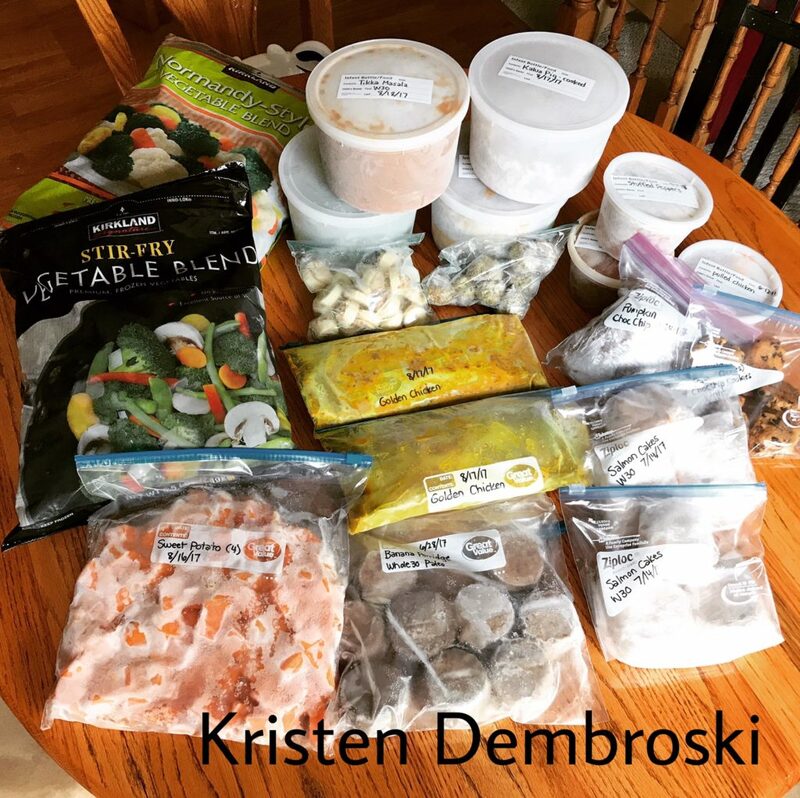 paleo | Kristen Dembroski, Ph.D.
Having off of work is GREAT!!!! For the last 3 days, I have been cooking and baking like a madwoman. 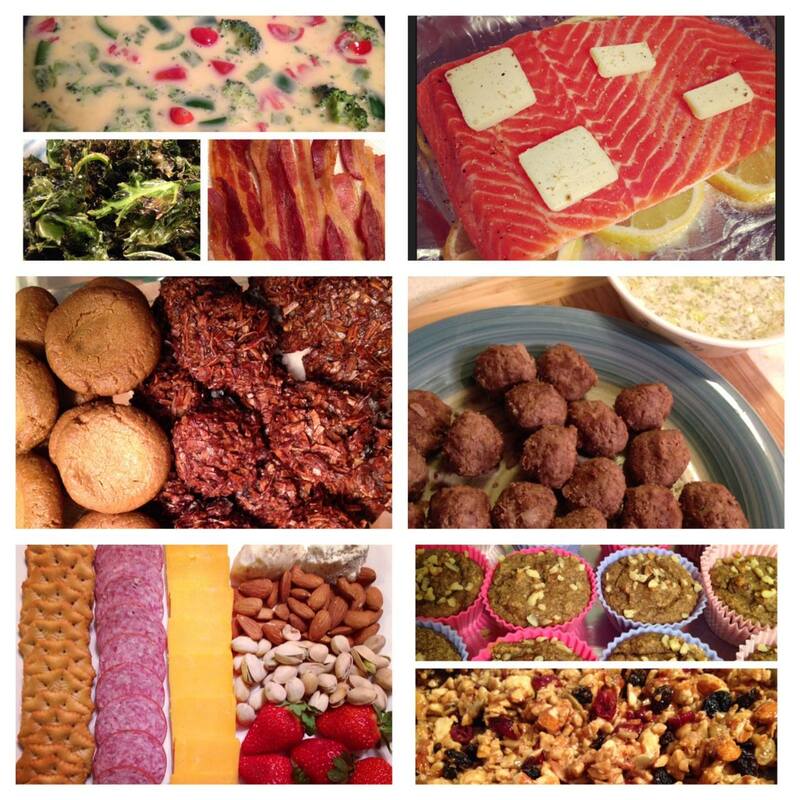 I’d love to share some photos and recipes with you. 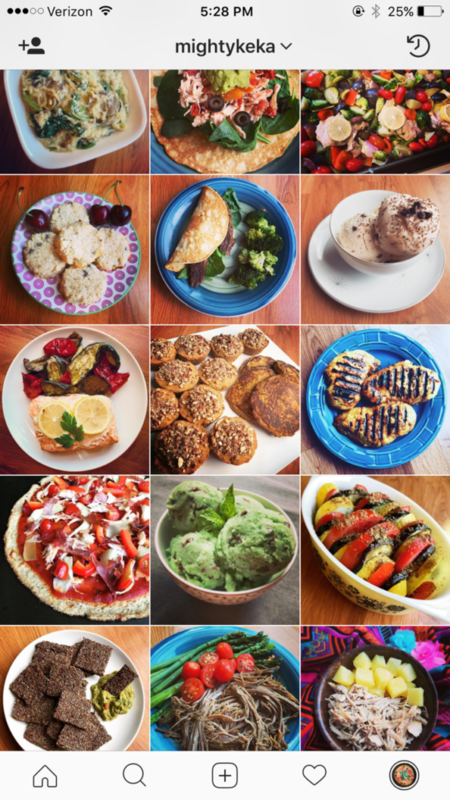 By the way, all of the food below is Paleo, which means grain and dairy-free. 1. Vegetable Omelet – just egg, unsweetened almond milk, peppers, tomato, broccoli, and avocado on top at the end. 2. Baked Kale – delicious! Just put a bunch of kale in a bowl, add a tablespoon of olive oil, and mix. Then spread the kale on a baking sheet, sprinkle with sea salt, garlic, and ground pepper, bake for 10 minutes at 350, et voila! 3. Bacon – I bake the bacon on a metal rack on top of a baking sheet so the grease can drip off. Make sure to line the baking sheet with aluminum foil for easier cleanup. 350 for 20-30 minutes. 4. Salmon in a Bag – I cut 6 round slices of lemon to line the bottom of a piece of aluminum foil, then placed the salmon on top. I sprinkled the salmon with salt and garlic, then topped with a few thin tabs of butter. Close up the aluminum foil, and bake at 350 for 30-40 minutes until the fish flakes apart and is cooked through. 5. Cardamom Thumbprint Cookies & Peppermint Macaroons dipped in Chocolate – I am a Norwegian, so I couldn’t resist trying the Thumbprint Cookies for christmas. The cookies turned out fantastic, and I will add that you really need to beat the vanilla frosting for at least 10 minutes to get the consistency you desire. I plan to add red and green food coloring for something festive 🙂 The Peppermint Macaroons turned out deliciously as well, but I will use less peppermint extract next time. Dipping the bottoms in dark chocolate (and licking the spoon!) was the best part! 6. Gyro meatballs and Tzatziki Sauce – this is BY FAR my favorite thing I have made! I used high grade ground sirloin, and I also pan-friend them after baking them to give a nice brown crisp to the meatballs. For the Tzatziki sauce, I used coconut milk instead of coconut cream or yogurt, and this was a mistake. It still tasted fantastic, but was a bit watery. 7. Party Tray – I made this for a party I attended. Crackers, 2-year aged cheddar, salami, goat cheese, almond cheddar spread, pistachios, almonds, and strawberries. Obviously the crackers and cheese are not Paleo, but the rest is proof that you can enjoy Paleo snacks with your friends! 8. Banana Nut Muffins – these are mostly just bananas and eggs with very little flour. They taste pretty eggy to me, but perhaps I should have used more ripened bananas. They are great warmed up with a touch of butter. 9. Homemade Granola – My husband and I just love this. It is absolutely better tasting than any granola I have ever purchased. I will make this again! Next time, though, I will add more nuts because there is quite a bit of the honey-mixture to go around. Wherever you are in the world, you may be aware of the winter disasters happening all over the south and midwest. My sister was stuck in Dallas for 2 days waiting for a flight back to Wisconsin. Here in Milwaukee, the highway is a parking lot, and the snow is falling heavily and consistently. My mom was supposed to go to work today, but after spending 45 minutes on the highway and getting no where, she called in and headed home. I hate thinking about my family out in this weather – it makes me so nervous! I haven’t left the house…. or my pajamas (tee hee). 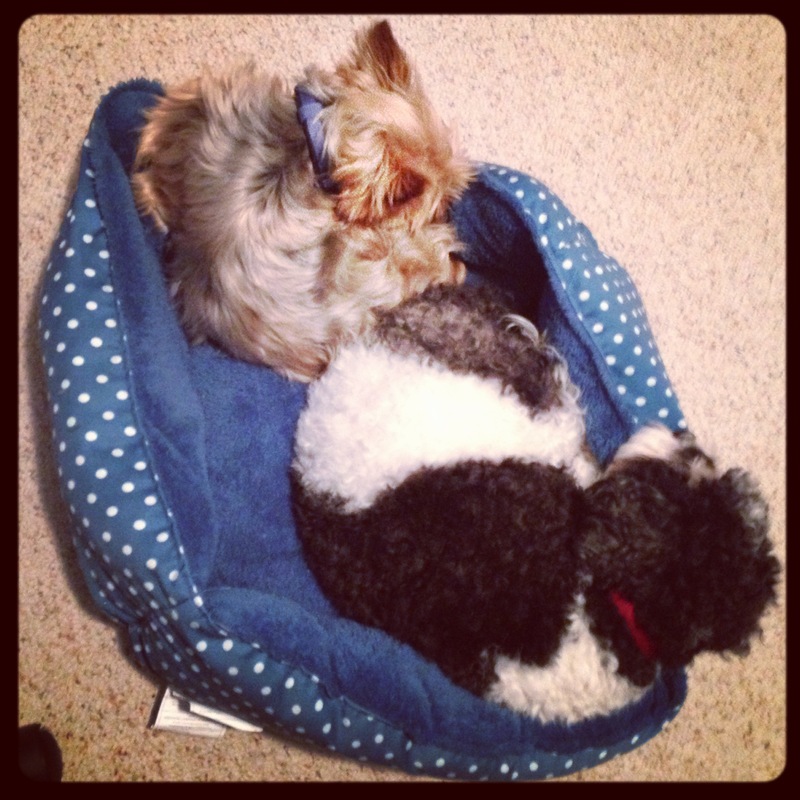 The dogs are doing their best to cuddle and stay warm, too. 1. Bacon! 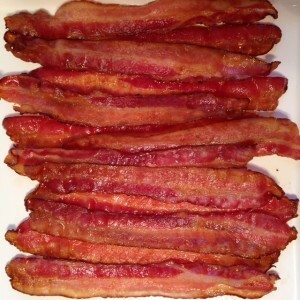 In the oven, I lay the bacon across a metal drying rack placed on a baking sheet to allow the grease to drip. 25 minutes at 350 degrees. 2. Energy Balls These were supposed to be bars, but they weren’t holding together very well. Maybe they needed a touch of coconut oil? Consists of: almonds, cranberries, figs, chocolate chips. 3. Heart Chili This recipe took a while – browning the ground beef, sautéing the vegetables, then searing the beef cubes. It was not a ‘just throw it all in the crock pot’ kind of recipe, but it does taste delicious. 4. Cauliflower Rice A delicious Paleo alternative to rice. I will say that my food processor sure got a workout this weekend! I didn’t have all of the spices the recipe called for on hand, so I just used sea salt, ground pepper, and cajun spices. 5. Strawberry Protein Balls These are a hit with my husband. I don’t think they’ll keep very long, so I am going to enjoy them quickly. 6. 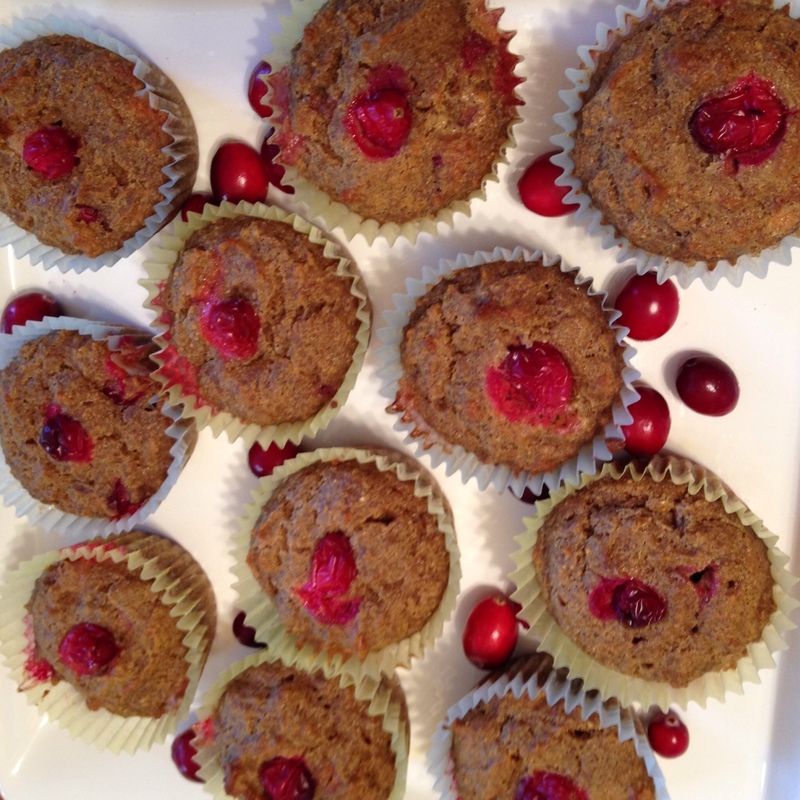 Pumpkin Cranberry Muffins I love taking these to work for a quick and filling breakfast. And you know what else I love? My new silicone baking cups. I’m never going back to paper! And now I need to buy the blue pack too (hint: these are a great stocking stuffer for the foodie in your life)! Our family tradition is to spend the weekend after Thanksgiving decorating the house for Christmas. We put up the tree and Christmas lights, which is such a fun thing to do as a family. I have one very important message for our new dog, Ruffy: Thou shalt not lift thine leg on the Christmas tree. And I mean it! Since I was in the spirit, I also decided to cook up a storm this weekend. It’s great to have a fridge full of prepared foods that are ready to go. 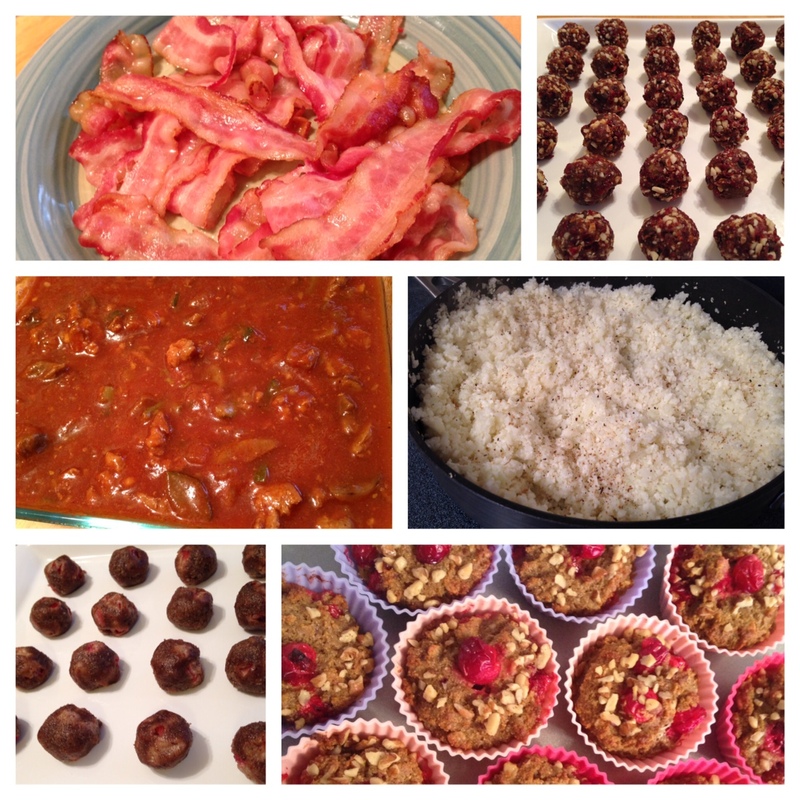 I spent practically the entire weekend in the kitchen. I’ve run the dishwasher 4 times in the past 2 days, sheesh! My husband assures me that our dishwasher is eco-friendly and actually uses less water and resources than handwashing, so that’s good. I’d love to show you what I made. As I’ve mentioned in previous posts, I am trying to switch to a Paleo diet. I am doing this slowly, and I’m up to 2 meals a day plus snacks. Hopefully I can make the permanent, full switch and stick with it! 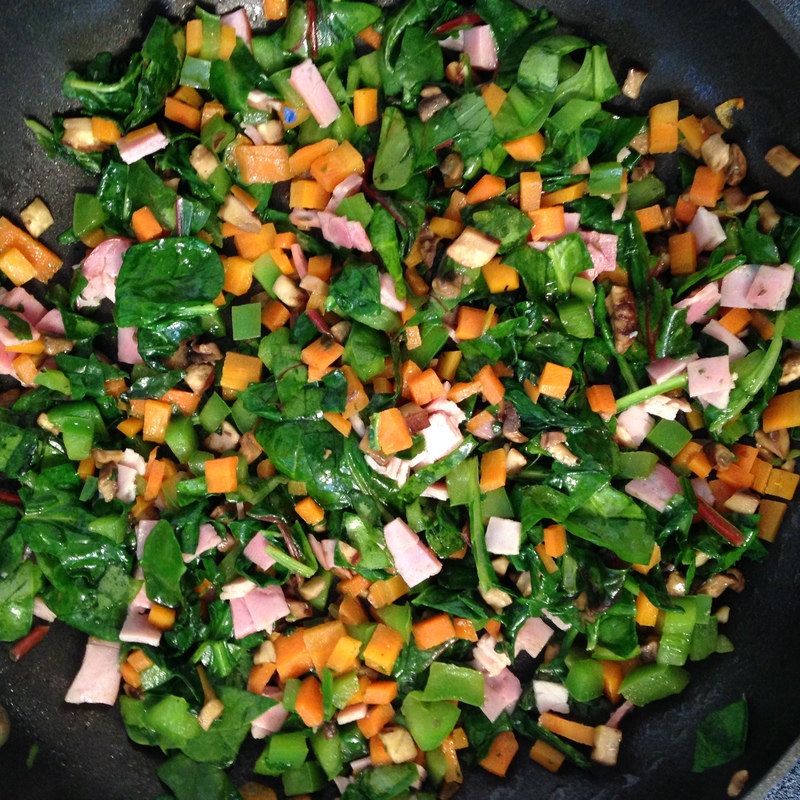 This recipe is from Practical Paleo by Diane Sanfilippo, BS, NC. The recipe is actually for a pie filling, but I decided to make it into a frozen treat instead. Next time, I would add little sticks to make popsicles, yum! 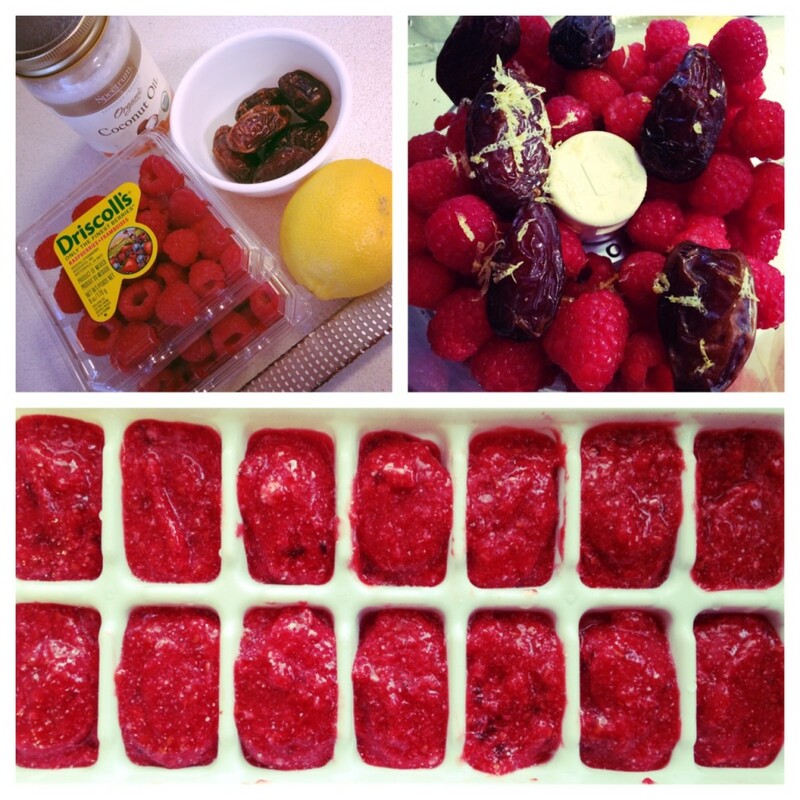 Ingredients: fresh raspberries, lemon zest and juice, medjool dates, and coconut oil and butter. 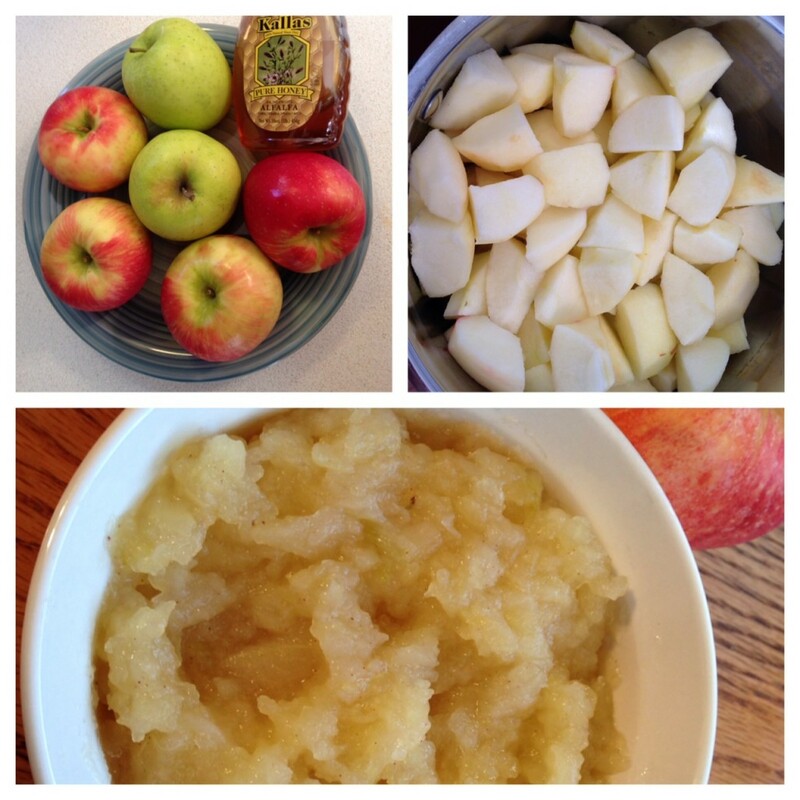 I keep saying to my husband, “This was so easy to make, and it tastes SO much better than store-bought apple sauce. Why wouldn’t anyone just make their own?” This is a Paleo applesauce with only 3 ingredients: apples, honey, and water (oh, and a dash of cinnamon). Tastes phenomenal, and no added sugar! Find the recipe here. 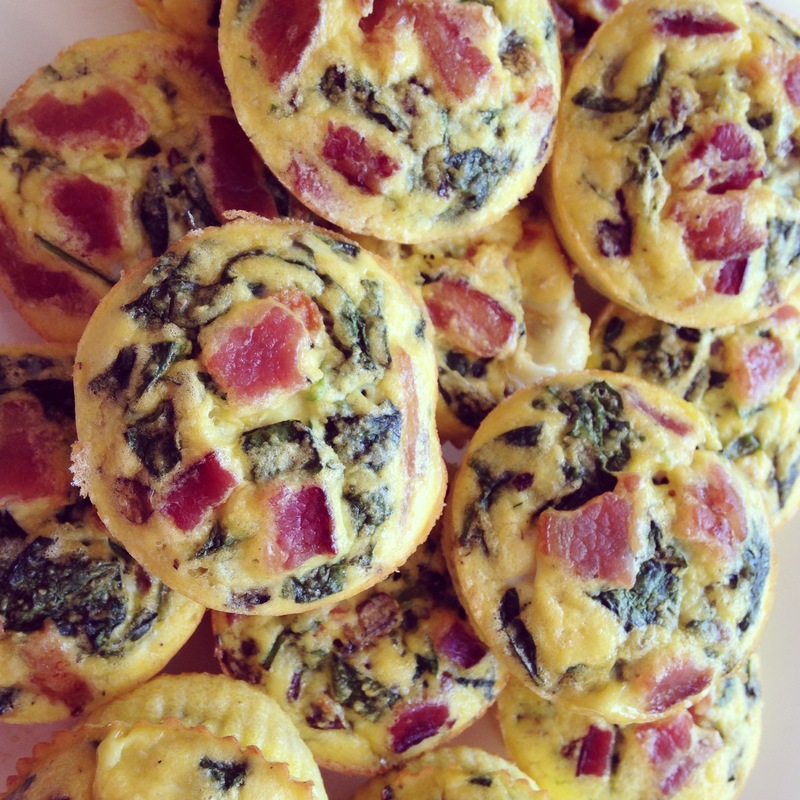 This recipe is also from the book Practical Paleo. I got to use my food processor a lot this weekend! 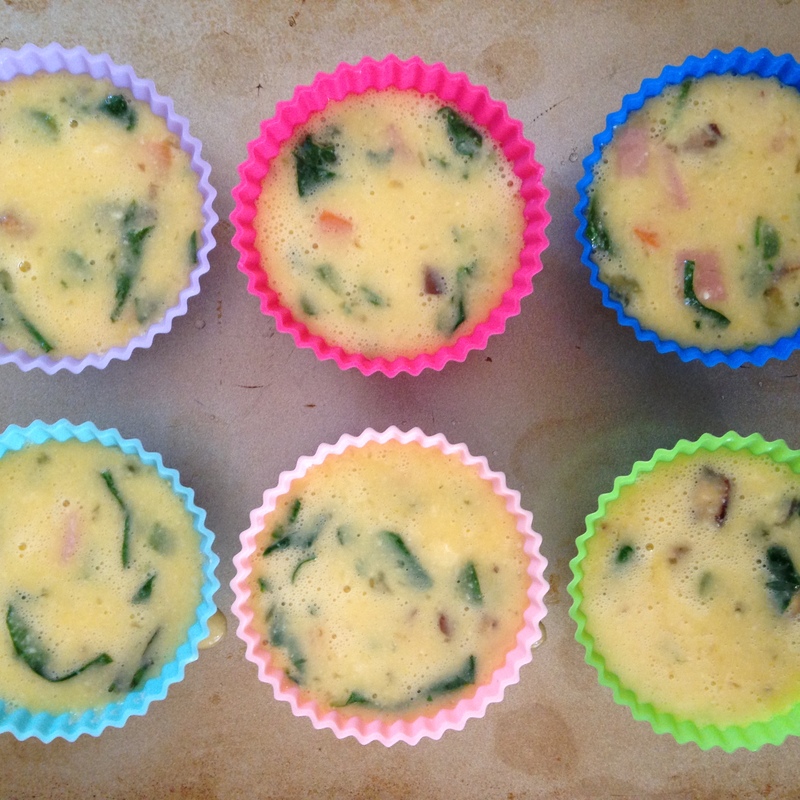 These taste wonderful and actually don’t use too many eggs (only 3). I plan to warm them up for breakfasts throughout the week, in addition to my Paleo Waffles I blogged about on Thanksgiving. I also came up with my own ‘recipe’ for a beef shoulder/roast I picked up at the grocery store. First, I added coconut oil, sea salt, and black pepper and pan-seared the roast in a skillet – a couple of minutes, just enough to seal in the flavor. Then I transferred the meat and oils to a casserole dish which I filled with apple cider (not covering the meat, but probably about an inch high). I see now that I need to purchase a Dutch oven – hint, Christmas gift! I baked the roast at 400 degrees for about an hour. It was very juicy and tasty! I served it with a side of baked yams and roasted squash. P.S. The dogs LOVE squash. Who knew? I always try to sneak a few vegetables into their food, and this one was a hit! 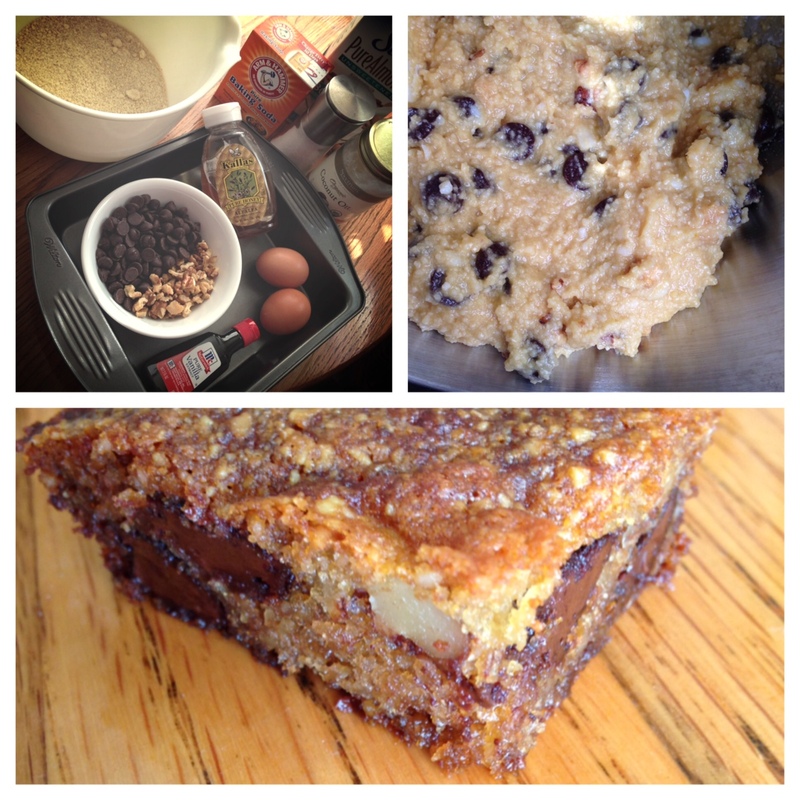 Here’s a link to the recipe for these amazing chocolate chip cookie bars. I added walnuts to mine. My husband and I are definitely going to fight over these! Later this week, I hope to make these Energy Bars. 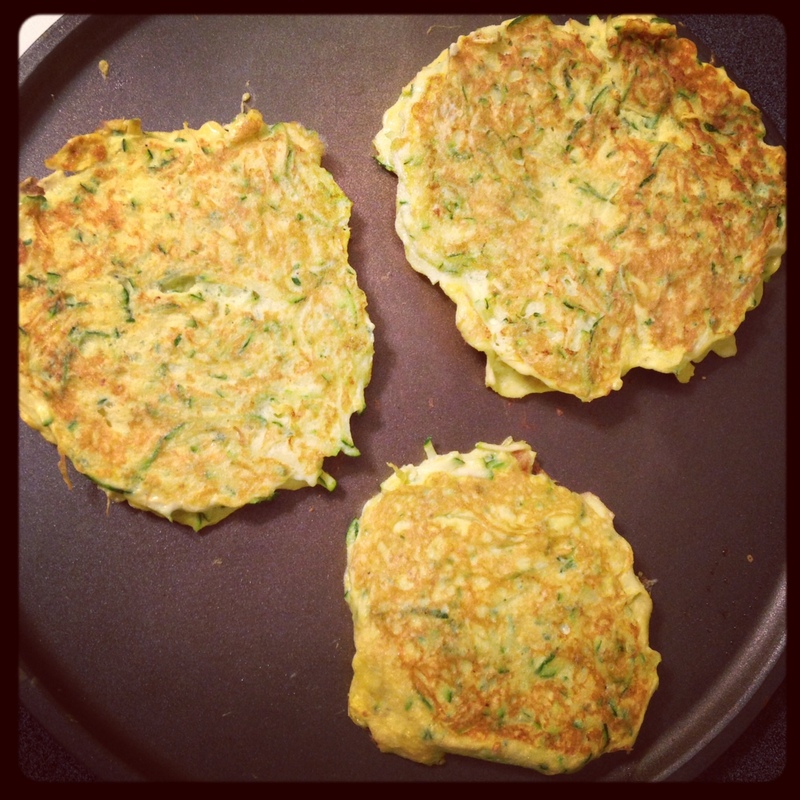 You know, my favorite thing about Paleo recipes is how SIMPLE they are! Just a couple of ingredients, things I already have on hand, and nothing crazy or exotic I have to go to a speciality grocery store to find. It’s perfect for me and my busy teacher lifestyle! 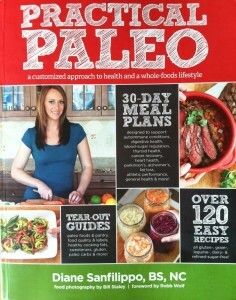 I have one more thing to share with you all regarding Paleo foods. 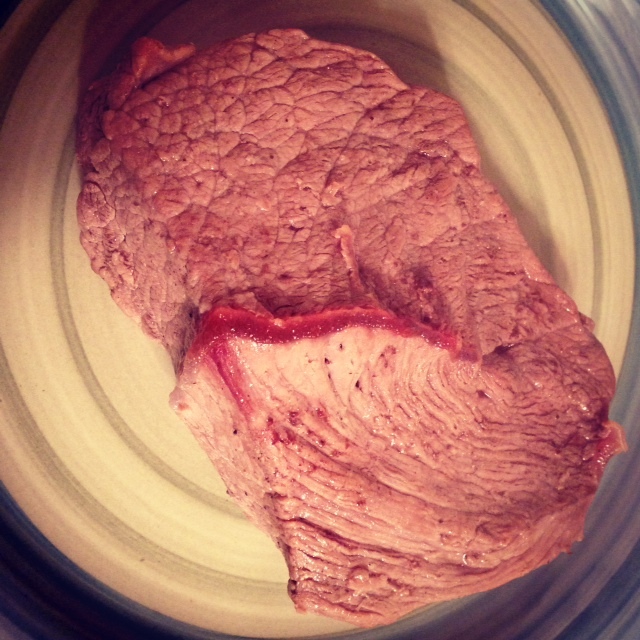 I found a great new blog called Nom Nom Paleo. She’s great! She recommended this Spiral Vegetable Slicer. I have wanted one of these for a while, and the reviews were great and the price was right – I ordered it! Excited to give this a try. Squash spaghetti, anyone? 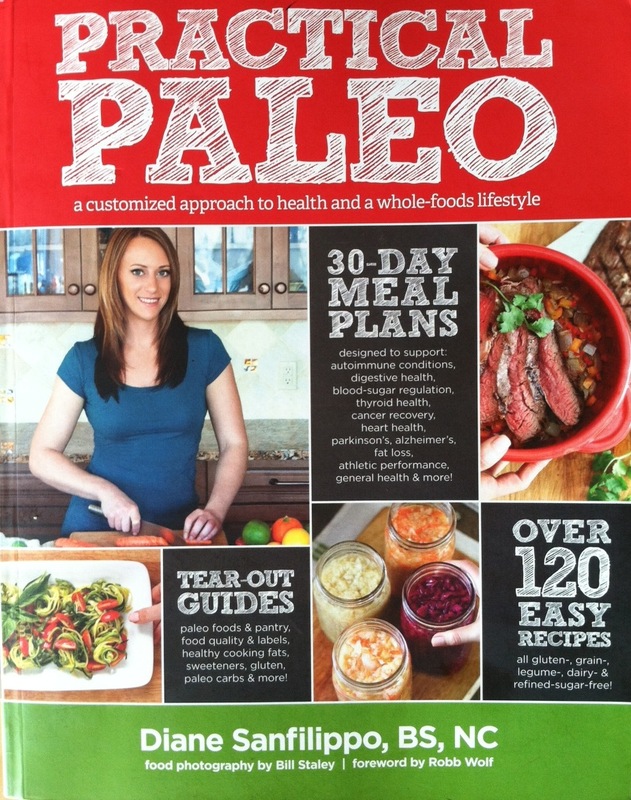 I recently purchased a copy of Practical Paleo by Dianne Sanfilippo, BS, NC. It has a wealth of information about eating whole foods. The idea of ‘Paleo,’ which is short for Paleolithic, is to return to the pre-agriculture, pre-industrialization diet that our human bodies were designed to consume. If you consider just the last 100 years, with the invention of the refrigerator and chemical preservatives, our bodies haven’t kept up evolutionarily to handle all of these new foods. You could also call Paleo the ‘Whole Foods’ diet or the Gluten-free diet. You get back to the basics of eating foods that don’t come in packages or boxes and have nothing but all natural ingredients. Flour, grains, sugar, and dairy are off-limits. 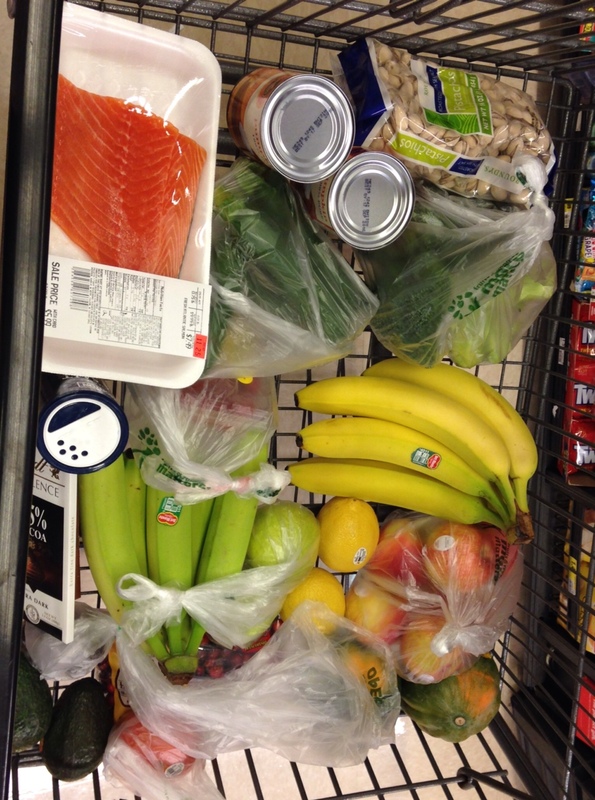 Fruit, veggies, meat, and nuts are in. Pretty simply actually. Sanfilippo explains that many of the chronic conditions and diseases that plague our modern society can be attributed to a diet high in gluten, sugar, and dairy that our bodies are unable to process. Eliminating these foods from your diet can have an extremely positive effect on your overall health, not to mention your waistline. Since I have several chronic conditions from IBS to rosacea, this seemed like a really attractive diet to adopt. Since ‘Going Paleo’ full time seemed scary to me, I decided to wade in slowly. I’d try one meal a day – breakfast – since we all know that it is the most important meal of the day. My typical breakfast includes a bowl of cereal with almond milk, but I’m hungry again in an hour. And then in another hour. And I’m starving by lunch. So I figured hey – what have I got to lose by trying something new? 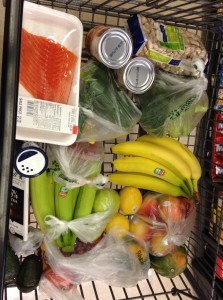 Hopefully, I’ll find a new way to feel fuller longer and regulate my blood sugar to sustain my energy for the morning. When I got home, I began preparing a few new foods to try for breakfast. 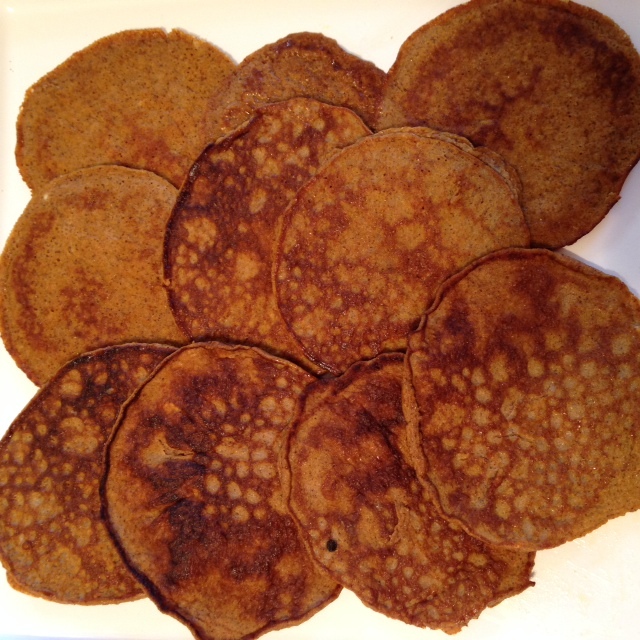 Sanfilippo has some very simple but delicious recipes in her book. I hard-boiled a half-dozen eggs as well so they are ready-to-grab. My lunches for the past 3 weeks have been chicken and vegetables with an apple, so that puts me at 2 Paleo meals a day actually – yay! I also plan to try out these Banana Berry Smoothies and these Paleo Waffles later in the week. Excitement!